SAMBA is a popular dance and rhythm all over Brazil The term originated from "semba", an African word for navel. Traditionally a circle is made with a solo dancer in the center. In the samba's rhythm there is a syncopated note which is the cue for the soloist to touch with her navel, the navel of the chosen person to replace her in the circle. One of the first in Samba history is Ernesto Joaquim Maria dos Santos, (1889 to 1974). Ernesto was known as Donga his ÒchoroÓ a type of Brazilian Samba is recognized as the first samba carnavalesco, Òpelo telefoneÓ. The band Oita Batutas performed the song was a huge hit during the 1917 Carnaval. Donga's aunt Ciata, originally from Bahia, practiced Condomble and was a great influence on the Samba music of Donga although others say it was her ability to invoke the orixas or rhythms of the saints that was made her so popular. Tia (Aunt) Ciata lived near the Pra�a Onze in Rio de Janeiro, a gathering spot of ex-slaves and immigrants from Bahia and the northeast of Brazil. Here Donga met other earlier music forms of Samba like the samba de roda (ring samba), the jongo, and the afoxŽ. Samba de roda was a dance often performed in the slums as a ring of people singing, clapping their hands and playing drums and other light instruments. There might be a competition between two people drawing connections to Capoeira. This ring is where the new samba dance steps were created! Until the beginning of the last century, Samba was considered the music of the poor. It was prohibited because of its African origins and because it was a way for Blacks to meet and congregate. 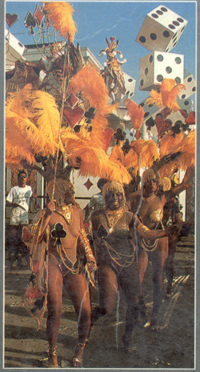 The samba was a festival, linked with the African religious cults, African food and African dance. In a search for cutural roots by the upper class it was revived. SAMBA is one the most difficult rhythms to learn due to its syncopation. There are great samba composer like Paulinho da Viola,Martinho da Vila, Chico Buarque and more that we will be adding to this site; but samba is played by people living in "barracos" or "favelas", by large "Escolas de Samba" in huge parades at Carnaval, groups just with percussion and horns. 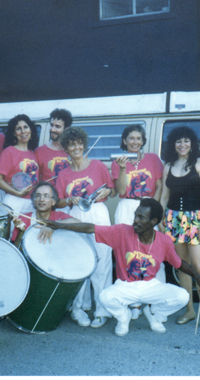 Many styles of groups were derived from and play samba. These are Afro-Samba (only percussion, singers and dancers), Pagode (guitars, cavaquinho and percussion) and Samba-Choro (flute, cavaquinho, mandolim, quitar). Samba became a Jazz style as well. CARNIVAL in Rio is Samba's biggest celebration. Its origins included rhythm and melody (voice), but now some schools include the "cavaquinho" and sometimes electric bass. The classic Escola de Samba group is normally formed by a 350-piece percusiion section including pandeiro, shakers, reco-reco, caixa playing the basic pulse; tamborim, frigideira, agogo, repinique and apito on the accents and surdos on the bass line.